Family and friends together with the graduating students and school staff enjoyed a ‘Bubbles and Brunch” event to celebrate our 2017 Graduating students. We wish all our students the best for their future careers and once again, a big congratulations to you all! The School would also like to congratulate those students who could not attend, some of whom have commenced roles interstate and overseas. 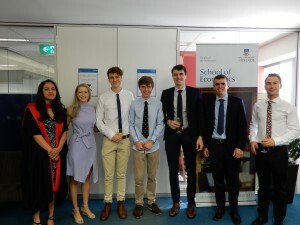 They are: Honours Graduates – Alistair Cameron, Matthew Johns, Lisa Mansfield, Thithi Nguyentran and Michael Stecher. Ph.D in Economics graduates – Robert Garrard, Xue Zhang, Wei Dai, Sok Heng Lay and Bo Zhang. This entry was posted in Events, Study, Uncategorized. Bookmark the permalink.